Pallacanestro Olimpia EA7-Emporio Armani Milano agreed on terms with the guard MarQuez Haynes, coming from the Artland Dragons of the German League, who also played the last Las Vegas NBA’s Summer League with the Washington Wizards (five games, 8.2 points and 3.4 assists on average), holder of a Georgian passport. 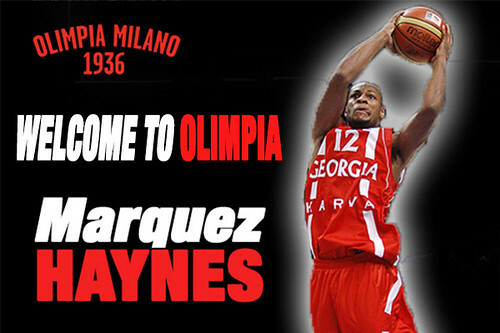 COACH BANCHI’S OPINION – “MarQuez Haynes is a versatile player, coming to Milano after precious experiences in three different leagues and at the European Chamionship of 2011, is capable to play the two guard positions, can use his athleticism and his energy on both ends of the floor. This season he’ll make his debut in Italy and in the Euroleague, and that’s an obvious reason to live the EA7 experience with great enthusiasm and motivation”. WHO’S HAYNES – MarQuez Haynes was born in Irving, Texas, on December 19, 1986, he’s 1.85 mt tall. He played for the Irving Nimitz High School where he averaged more than 21 points per game in his junior season, third overall in the Dallas area (first was the eventual NBA player, CJ Miles). As a senior he moved to the Irving High School bringing it to Texas State finals and obtaining a scholarship to attend the Boston College. He remained there two years then he came back to Texas to play for Texas-Arlington after a one-year stop imposed by the transfer rules. In his last college year, he was named Player of the Year in the Southland Conference, was the third best scorer in the country averaging 22.6 points per game with seven games scoring at least 30 points. He also had a 40.9% shooting percentage form three and 3.7 assists per game. Undrafted in 2010, he then played one year in France at Chalon (14.4 points, 3.8 assists, the team also reached the final game in the Final Eight), one in Spain in the Canary Island (10. 9 points, 1.6 assists) where he made his debut in Eurocup and the last in Germany, in Artland, playing again in the Eurocup. In 2011, he played the European Championship in Lithuania with the Georgian National Team. NOTES – Haynes played along Jared Dudley (Los Angeles Clippers) and Tyrese Rice (Maccabi) during his two-year stay at Boston College… With the Georgian National Team he had as teammates Manu Markoishvili and Viktor Sanikidze… He run his own website www.houseofhaynes.com… His parentes are Keith and Angela, he has one brother and one sister… In spite of playing for UT-Arlington only two years, he’s twelfth in the college All-Time scoring list.